Born: 20 September 1841, Cape Town, South Africa. Died: 21 November 1882, Bloemfontein, South Africa. 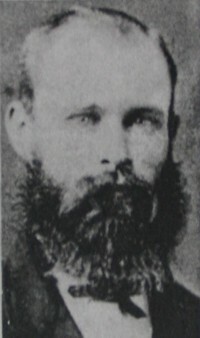 George F. Stegmann, first surveyor-general of the Orange Free State (now the Free State), was the eldest son of Johannes A. (John) Stegmann and his wife Engela M.J. van Niekerk. He studied at the South African College, Cape Town, from 1854 to 1859 and was admitted as a land surveyor in the Cape of Good Hope in 1861. That same year he moved to the Orange Free State and settled in Bloemfontein. Soon after his arrival he bought the farm Tempe near the town. When he started working as a surveyor in 1864 one of his younger brothers, Hugo, arrived from the Cape to manage the farm, but he was killed by a Basuto raiding party soon afterwards. In 1866 George Stegmann was awarded part of the contract to survey farms in a region captured from the Basuto. He also surveyed the town lands of Reddersburg (1864), Zastron (1867), Dewetsdorp (1874), Ladybrand (1875) and Ficksburg (1875). In 1872 he was appointed chairman of a commission to investigate the overlapping of farms in the Harrismith district and was praised for the way in which he solved complex land claims. In 1876 the government of the Orange Free State decided to create the post of surveyor-general for the territory and on 8 August appointed Stegmann to the position. (John H. Ford* had held a similar position in the earlier Orange River Sovereignty). Stegmann was mainly concerned with conflicting land claims by farmers of the republic. Around 1878 he accepted Gustav Baumann* as an assistant for training. As a result of deteriorating health he appears to have resigned his post in 1881 and set up a private practice with Baumann as a junior partner. In June that year he went to England for medical consultations, leaving Baumann in charge. He returned in 1882, but died from kidney disease later that year. He was not married. At the time of his death he owned several farms, which he left to his brothers Dirk and Albertus. He was succeeded as surveyor-general by J.C. Fleck*. Baumann, G. & Bright, E. The lost republic: The biography of a land surveyor. London: Faber & Faber, 1940. Cape of Good Hope. Report of the Surveyor-General, 1880. Cape Town directory..., 1865, pp. 89-90, Sworn land surveyors. Liebenberg, E.C. Die topografiese kartering van Suid-Africa, 1879-1972; 'n histories-geografiese ontleding (pp. 137-138). MA-verhandeling in Geografie, Universiteit van Suid-Afrika, 1973. National Automated Archival Information Retrieval System (NAAIRS). . Documents relating to Stegman, George F. / Stegman, G.F.
Ritchie, W. The history of the South African College, 1829-1918. Cape Town: T. Maskew-Miller, 1918. Van Rensburg, J.F.J. George Frederick Stegmann, eerste Landmeter-Generaal van die Oranje-Vrystaat. South African Journal of Surveying and Mapping, 1991, Vol. 21(1), pp. 9-13.